Nothing could be more British than afternoon tea, says John Honeywell – even when it’s prepared on board ship by a brilliant (if slightly eccentric) Frenchman. Cucumber sandwiches are a centrepiece of the Queen’s Buckingham Palace garden parties; fondant fancies fill plates at country house hotels, and there is unlikely to be a resolution any time soon to the debate between Devon and Cornwall over whether it should be jam or cream first on fresh, warm scones. (Just for the record, I like my clotted cream – not whipped, thank you – on top.) 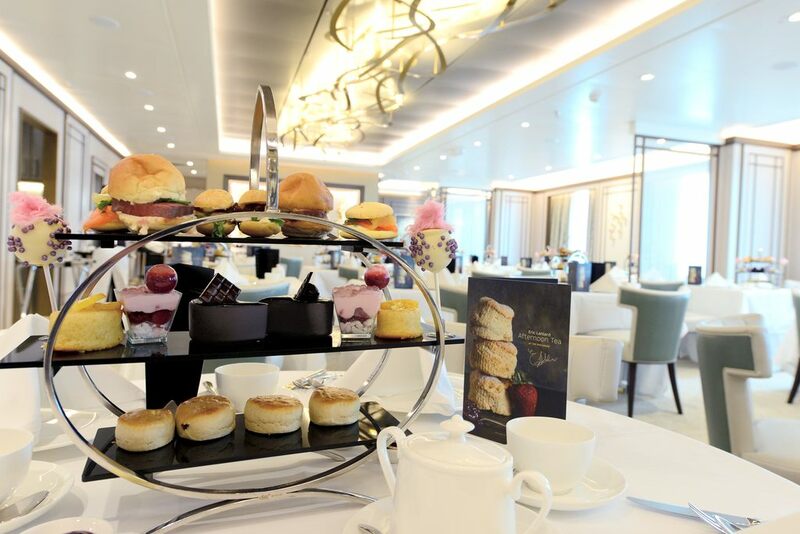 P&O took a bold step when they chose a French patissier to join their Food Heroes and come up with a refined menu for the afternoon tea served in the Epicurean Restaurant on board flagship Britannia. 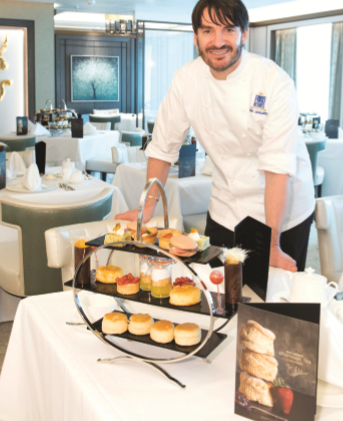 Regardless of its origins, Eric’s Epicurean Afternoon Tea has proved a huge success during Britannia’s first year, and has also been introduced to Azura and Ventura. It may follow later on other ships in the fleet. A sell-out every sea day, it offers delights such as Scottish Smoked Salmon and Dill in a Lemon and Cracked Black Pepper Macaron (see recipe); Roast Beef in a Brioche, Cheese Éclair, Exotic Pop Cake, Dark Chocolate Tear Drop, Summer Berries and Meringue, Orange-Infused Almond Cake and, of course, scones –with an added twist of lemon. The basic price – including your choice of tea – is £15 each; add a glass of Champagne and it’s £20. Excellent value compared with the £135 I paid for afternoon tea for four at a rather grand seaside hotel on the south coast of England a few weeks ago. Eric’s presence on board Britannia is also felt at the casual Market Café in the ship’s atrium, where a selection of his cakes is available throughout the day. St Clement Chocolate Cup, Lemon and Yuzu Tart, and Vanilla Cheesecake with a baked Oreo cookie crumb (see recipe) are £2.95 each. Eric recently demonstrated one of his recipes, a dark chocolate mousse with caramelised smoked apple, to a group of journalists visiting Carnival UK’s development kitchen in Southampton. Afterwards, I grabbed him to get his impressions of his first year with Britannia. “The Epicurean Afternoon Tea is such a cheeky thing to do when there are so many free options also available, but it has been really successful. The response has been overwhelming,” he said. “I spend a minimum of 20 days a year on Britannia and I will be doing four cruises this year. It’s important to ensure the staff are fully trained so the guests get the right experience. While I’m on board I will join them for tea in the restaurant, I take part in sessions in the Cookery Club, and host dinners. “This year I will be escorting some excursions as well. I will be taking guests to a patisserie in Guernsey and to a bakery in Madeira. It’s great fun.” Also on the menu at the development kitchen were some new dishes created for the Verandah Restaurant that will replace Queen Mary 2’s Todd English after the ship’s refit this summer. Chef Jose Sol was carving wafer-thin slices of prime Iberico ham, which faced stiff competition from plates of Galician blonde beef. A tempura of fresh French oysters will no doubt prove a hit, as will the Chalosse Liquorice-lacquered Duck Breast with Yorkshire Rhubarb. The tasting session demonstrated how the food and beverage backroom staff are always striving to find new dishes with regional provenance. They have even come up with a goat curry to be served on board Adonia now the ship has left P&O’s fleet to join Carnival’s new brand, Fathom. Also in the kitchen is a micro propagator cabinet that will be used to grow fresh herbs on board ship, and a “green egg” barbecue that is being used by the development chefs to create new dishes. It’s all part of the ceaseless quest to provide memorable meals that keep the customers – quite literally – coming back for more. 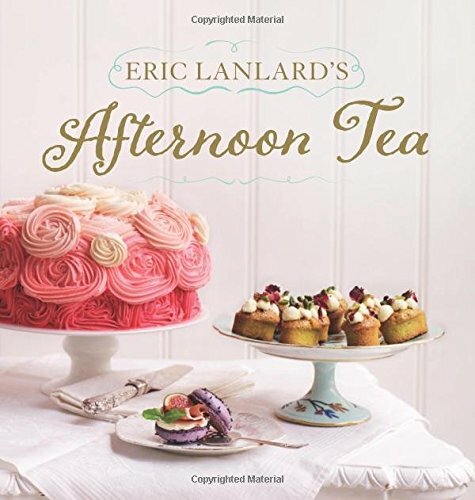 Eric Lanlard grew up in a village near Quimper in Brittany, northwest France. Inspired from the age of 10 by the taste and smell of cakes from the local patisserie, he trained there as a pastry chef. He moved to Luxembourg to become an apprentice chocolatier and carried on baking during his national service in the French Navy. He moved to England in 1989 when he was recruited by the Roux brothers. Two years later he was appointed head pastry chef at Le Gavroche. He left to set up his own business in 1995; that later closed but in 2005 he set up Cake Boy – a shop and cookery school near Wandsworth Bridge, London. Eric made wedding cakes for Liz Hurley and Claudia Schiffer, and a croquembouche for the wedding of Madonna to Guy Richie. He created a 101st birthday cake for the Queen Mother, and a first birthday cake for Brooklyn Beckham.